And now, the song parody (changing a few words around counts as parody, right?) that instantly popped to my head when I saw this page. Be warned: it was apparently so bad that none of my buddies on tumblr would reblog or even like the post. Non Sequitur: Did you use to post here as TheHefner? Nope. I'm a giant fan of his, though - he influenced about 50% (maybe more) of my opinions on Batman and comics in general. Hefner himself had a messy fallout with this site (I think it was) a year ago. Hasn't posted since. Well I asked cause the older Batman stuff I saw you posting recently reminded me of him and and inspired me to go back and reread a lot of stuff. So, The Batman interpretation of the Penguin as a martial arts master had some grounding in reality after all. Well, except for the robot Geisha's. I don't really think its ever concerned WHAT they are, but IIRC they never spoke and they had a very VERY wide range of movement on their limbs. So either robots or Penguin found a pair of contortionists who put Ty Lee to shame. In the Animated universes you can get a ninja PA (Like Baby Doll did in BTAS), it wouldn't surprise me that contortionist assassins are available for employment. The sight of watching Penguin do karate is new and strange, but yeah, I can see him having some non-acrobatic street-brawling skills! Kind of like an old boxer gone to seed. I can see the Penguin being ruthless and underhanded to make his rise to the top, but I just can't buy him being any sort of brute or martial artist. Now, if he'd hidden a zip gun up his sleeve, that would make sense. Not even bartitsu? He is a gentleman, after all. Just look: he's so devoted to his gentlemanly class that he won't even take his monocle out while boxing. Nope. There's a number of things I could see the Penguin doing in this case, but nothing so mundane as simply punching the bully in the mouth. Fist full of sand to the eyes followed by hitting the bully in the head with a large rock? Yes. Blindsiding said bully with a car? Yes. I agree 100%. This just rings false to me for the Penguin. Your ideas all sound so much better. "What ya gonna do, peck me to death?" That's actually exactly what he does in "Penguin Triumphant", the other story around this era to look into his past with bullies. I'll see if I can post that panel here some time. I remember this. I took a lot of influence off Sam Kieth (mostly from EPICURUS) and have always liked the art on this story. But Sam Kieth could draw anything and I'd love it. At the same time, I also always thought the attempt to darken the Penguin here was a bit forced. And also very typical of that particular moment at DC, around 88-90, to sludge the DCU up a bit post-Miller and Moore. It's an awesome story which I must see if I can dig out. That was Alan Moore?! Wow. Turns out I was a fan of his work before I even knew who he was! Yeah, he wrote both stories in that annual, the Penguin one, and the Clayface III one. Both are excellent. Actually, Max Allan "Jason steals the tires off the Batmobile" Collins wrote the Penguin story. Moore only did the Clayface one. Really? Wow, I'd forgotten it wasn't Moore, and even more that something so charming and frothy came from the guy who helped create the world's most sullen Robin. IMO, Jason being sullen was at least 85% Starlin's fault. Going back and reading Collins' original Jason stories, I've found that Jason actually wasn't that unpleasant under his pen. And heck, Collins always had a streak for Silver/Bronze Age nuttiness, even though his run happened at the very start of the DKR/Year One era. Remember, this was the guy who spent an entire issue showcasing an evil mime. How many people has Batman done that to? I remember the Calendar Man special had him reform, then Batman showed up in his apartment and snarled "I'll be watching you every moment of your life" so he went back to committing crime. And he also kinda drove Harvey Dent back to being a criminal because he instantly suspected him of being a murderer. Also, there's a suggestion that he might have done the same with the Mad Hatter (Or Hatman as he now seems to be being called) in the Barr/Davis run, though it might well have been that the Hatter was already headed that way. Hunh. So was this an in-joke at how Burgress Meredith played both Penguin in the 1960s BATMAN show, and Mickey Goldmill, an ex-bantamweight fighter, in the ROCKY movies? 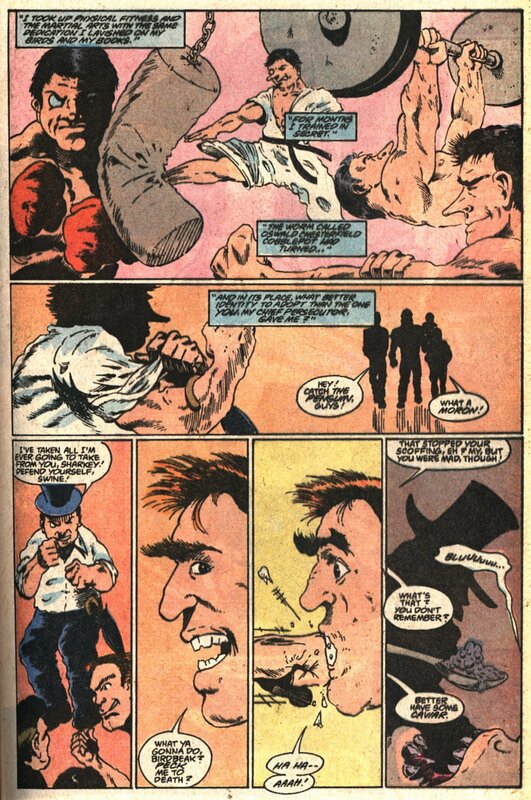 I recall that thinking himself a physical match for Batman was mentioned as his biggest flaw, which eventually was rectified by going semi-legit with the Iceberg Lounge, but I could easily see him taking up boxing and judo and other martial arts to improve himself by any means possible. I'm trying to recall any story where he viewed himself as a physical match for Batman, and not coming up with much. I confess I would find it just to be too much of a stretch that a short, podgy (if not actually obese), unfit little man would be a serious physical match for Batman or Robin without the aid of his gimmicked umbrella's and well paid gang of henchmen. As I said, he believed himself which was his flaw according to Batman rather than send henchmen to do his fighting and crimes. I was specifically thinking of a 90's story where he faked being dead through hypnosis to escape from jail. Alan Grant kept up the "Penguin is in shape" stuff into present day, if I recall correctly. During one Penguin arc in his run on Detective, Penguin actually managed to keep up with Batman in physical combat, and Batman even notes how he keeps himself in shape despite being overweight. There was also a post-Iceberg Lounge story where a henchman implied that he personally broke the arm of any hench that gave him bad news.